shape. Once the newly formed reed hat is removed, trimmed and allowed to cool, a single piece of red felt is cut and placed over it. The embryonic hat is then placed back on the inner mold and the heavy outer mold is lowered over the felt covered reed form. The ﬁnal hat takes shape as a kerosene burner on the waga heats the form for seven hours at 190º inside the molds. 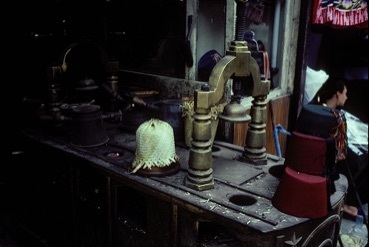 Once the newly formed tarboush is cooled and trimmed, a lining is sewn into the hat, the silk sash added and the shop’s sticker is glued inside. Lastly, a paper band is placed around the ﬁnished hat for protection. 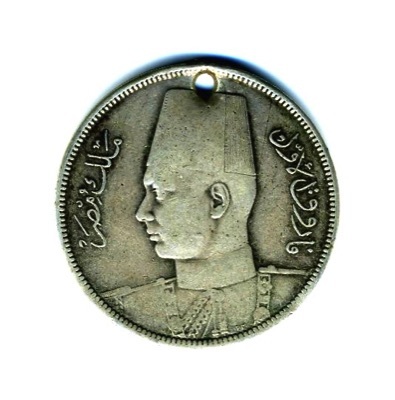 Not every tarboush is created the same and, since each one is designed to take into account the wearer’s head size and face shape, there are over 160 different brass molds available to accommodate these variations. One gets the feeling that a tarboush maker could be a successful phrenologist with little additional studying. Just like the wearer, not every tarboush is the same height or color. At one time Egyptian police wore taller black models with a red sash so that they could be easily identiﬁed in a crowd. While ladies preferred a short blue model worn with a scarf. There are many other variations of colors and sizes on display in the shop’s old and dusty glass cases. Many famous, wealthy and royal customers have visited the shop over the past 150 years. So many in fact, that the shop is one of only a few in the souk that has a back door. This rear door was used by the wealthy and famous to come to the shop for a tarboush ﬁtting in privacy. One such famous client who visited the shop was King Mohammed V of Morocco, the father the present King Hassan, who paid 96 gold piasters for his tarboush. King Farouk, on the other hand, always had the proprietor come to his royal residence for his ﬁttings. 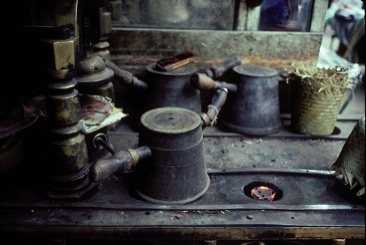 Of the once numerous tarboush makers in Cairo, today there are only two still in existence. The hat’s loss of popularity and the younger generation’s disinterest in non-western headgear have destined the tarboush a thing of the past. Mr. Al Trapiche said that he recently turned down an offer of 3,000,000 Egyptian pounds ($800,000) for his shop. He believes that his refusal to sell was an act of social responsibility to help maintain a part of Egypt’s cultural heritage. There may be one hope for the tarboush, however, if the head of the political Nation Party, Ahmed Sabahi, can convince parliament to declare the hat the national headdress and Egyptians one again embrace it. as well as being the mainstay of Shriner’s conventions and parades. 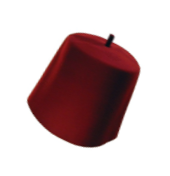 This highly recognizable red felt hat adorned with a long black silk tassel is more commonly known as the fez, tarboush being an Egyptian word. The hat originally was an exclusive product of Fez, Morocco and eventually its use spread across North Africa and then into the Ottoman Empire. It was the Ottoman Sultan Mahmud II (r.1808-1839) who ﬁrst introduced the fez in 1826 when he abolished wearing of the turban by certain of his troops in favor of the newly arrived hat from Tunisia. The new mandatory military headwear caused an uprising among the ultra-conservative Janissaries (imperial guard) which was diffused when forces loyal to the Sultan massacred them. The new headwear also met the needs of Muslim worshipers for a head covering without a brim so that they could touch their forehead to the ground during prayer. One addition to the hat was the black silk tassel symbolic of the single hair used by Allah to raise devout Muslims to Paradise. 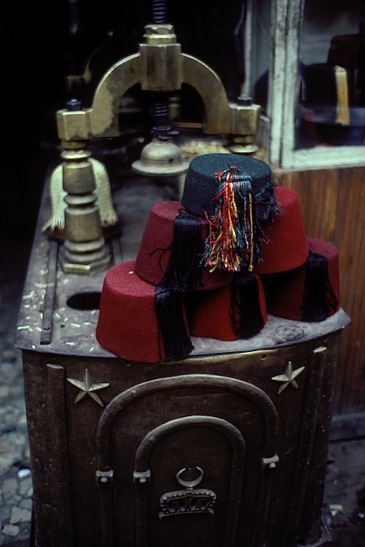 By the late 1820s all Ottomans were required to wear the fez by ofﬁcial decree. 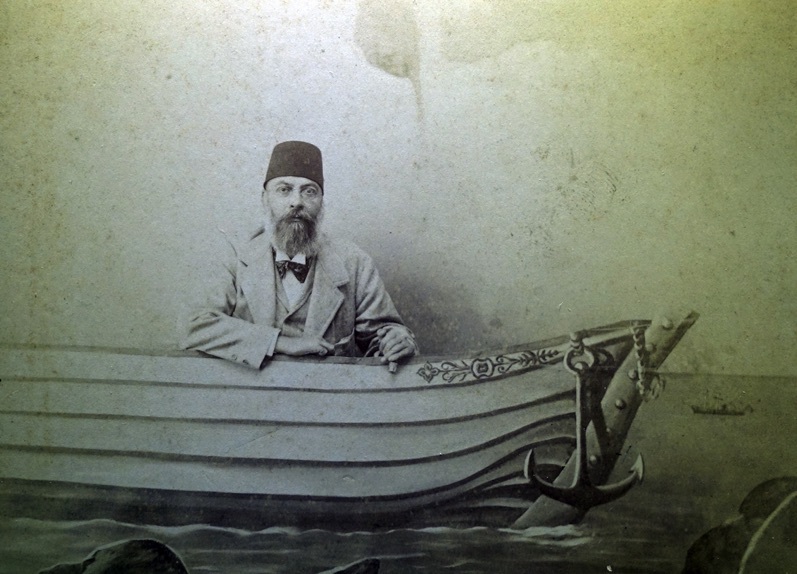 The tarboush had been worn in Egypt for several decades before it was ﬁrst introduced in Turkey but it was under the direction of Mohammed Ali, Viceroy (r.1805-1847) that the Ottoman fez requirement was enforced. 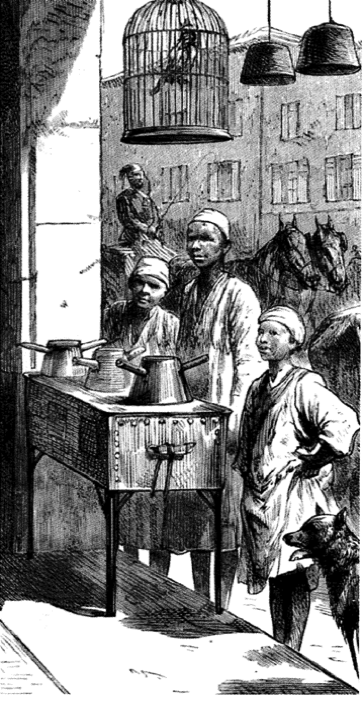 Its use in Egypt soon grew to such a point that local production was needed in order to keep up with demand. The earliest Egyptian factory was set up and staffed with Tunisian workers under the supervision of a Moroccan. At its peak, the factory was producing over 700 tarboushes a day. In 1925 Kamel Ataturk (president 1923-1938) banned the fez in favor of western style hats as part of his campaign to modernize Turkey as well as to eliminate exclusionary practices of religious factions. 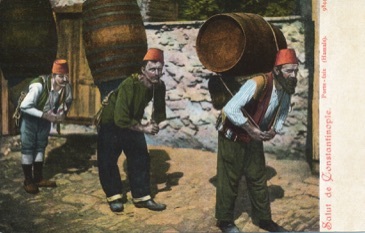 For those that did not comply with the new regulation and continued the wearing the fez, jail sentences and hanging resolved the dispute much to the wearer’s dissatisfaction. 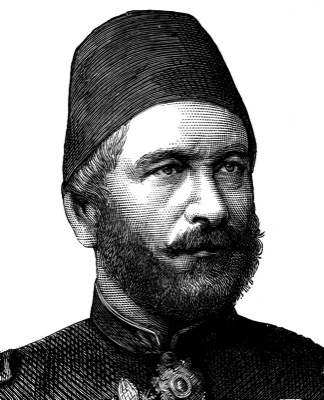 In Egypt, however, the Turkish ban had the effect of making the hat ever more popular, in part as a reaction to the dislike of Turkish dominance. 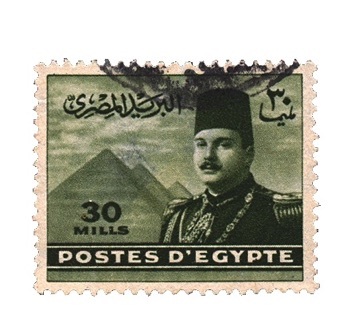 The tarboush ﬁrst began to lose favor in Egypt when President Muhammad Naguib after the overthrow of King Farouk appeared in public without it in 1952. The ﬁnal blow to the tarboush came in 1954 during President Nasser’s modernization campaign and was banned by him because it was considered a symbol of Turkish dominance. He even went so far as to ban photographs of King Farouk wearing the tarboush. 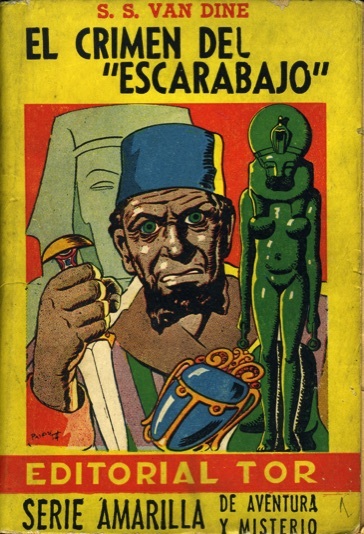 Today in modern Egypt the once common headdress has been relegated to actors in old black and white Egyptian movies, hotel doormen, waiters and monumental bronze statues in busy Cairo intersections. There are, however, still a few older men both in the city as well as in the countryside who wear the headdress portraying an exotic and sophisticated look. The “tarboush” of choice today by the younger generation is the increasingly more popular baseball cap, which has now replaced the once familiar Egyptian symbol. The Waga used to shape and form the felt tarboush. 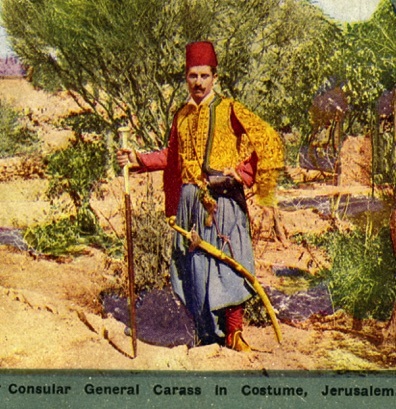 Studio photo of two Tarboush guys wearing tarboush. I began my search to discover the remaining tarboush maker while picking up my Egyptian press credentials at the Press Center in Cairo. When I was asked if the staff could assist me in any way, I inquired if anyone knew where a tarboush maker was located. After some discussion among the staff members, I was told that no one knew where a tarboush maker was or even, for that matter, s if any remained in business. My next inquiry was made at the Nile Hilton where the concierge also remained without a clue. He admitted that after 30 years on the job he had never before been asked by anyone where a tarboush maker was located even though the hotel’s doormen wear the distinctive hat. Since the concierge didn’t have the answer to my question I knew that I was on to something big at that point. My ﬁnal inquiry was to a cab driver in front of the hotel who beckoned me to hire him. I explained to him that I was now on a quest to ﬁnd the last tarboush maker in Cairo and that I was in need of a driver as well as a guide. He immediately assured me that he knew of a tarboush maker and that he could take me directly to him. My suspicious nature required quizzing him further when he admitted that he was not exactly sure where the maker was located, but that he was conﬁdent that one still existed. At that point I engaged him to take me to the Khan al-Khalili bazaar. In Cairo, if you need anything at all, no matter how exotic, abstract, or difﬁcult to come by, this is the most likely place to ﬁnd it. inﬂated price. When questioned where the shop was that made the tarboush he immediately began to explain that the hats were from a town near Alexandria. He assured us that there were no tarboush makers left in all of Cairo, a point that he became very animated over and repeated a number of times to emphasize his thorough knowledge on the subject. I was entrenched in my desire to discover such a shop and directed my guide to continue on our quest. After some resistance on his part, we set out again to ﬁnd the illusive tarboush maker. We continued to negotiate our way through several more winding narrow side streets and alleyways, when suddenly fate placed us in front of a hat shop. The shop displayed many styles and kinds of Western hats including a rather large selection of neatly stacked tarboushes. 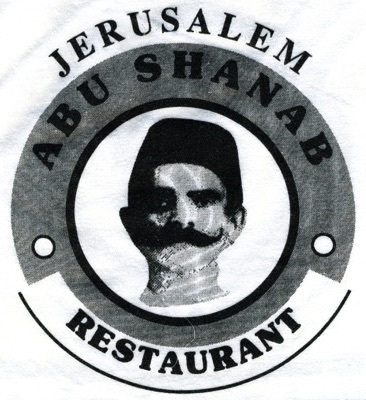 The proprietor of the shop, when questioned about the manufacturer of the tarboushes, became very excited and disclosed the name and address of the shop that was but a few blocks away. Once again we set off on what by now had become a wonderful walk of discovery. Across the street from the shop was an older gentleman wearing a ﬁne red tarboush who assured us that the shop to which we were now headed made the ﬁnest tarboushes available. He was even gracious enough to allow me to photograph him. My guide soon become lost in the maze of streets which make up the bazaar, and began stopping every few hundred yards to inquire if we were still headed in the right direction. After crossing under the busy main thoroughfare of Shari’ al-Azhar we arrived opposite Khan al-Khalili at the bazaar known as the local’s souk. A few hundred feet further on, we arrived at the cloth merchant’s shops where bolts of colorful fabrics lined the busy street. About this time a young gentleman named “Robbie” became interested in our undertaking and assured us that we were on the right path and insisted on taking us directly to the shop. 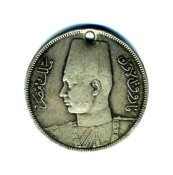 Mohammed Ali, Viceroy of Egypt. 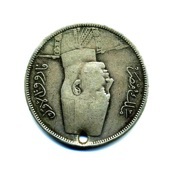 A silver coin of King Farouk and his tarboush. 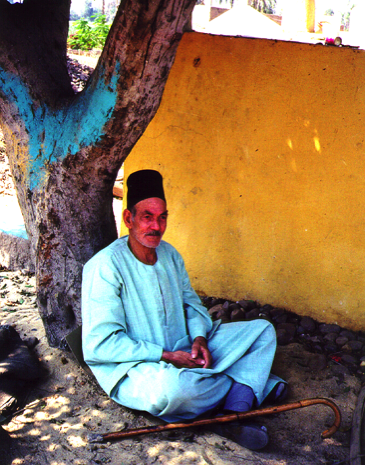 A man in Lower Egypt. A Ninteenth Century studio photograph. Istanbul. As we rounded a narrow bend in an alleyway off the main thoroughfare we caught site ﬁrst of one and then two open-fronted shops making tarbouches. Robbie assured us that the second and larger of the two shops was the oldest and the best. 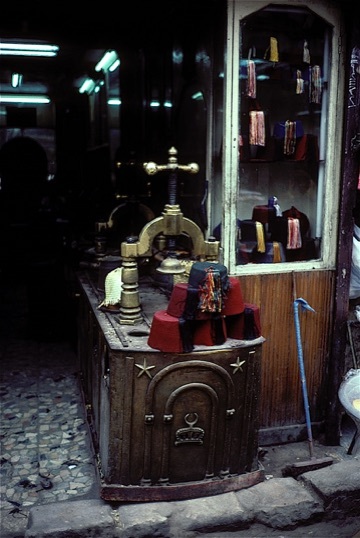 This was the shop of Mr. Ahmed Mohamed A. Al Trapiche the 40-year-old proprietor of Cairo’s oldest tarboush maker’s shop located at 36 Alghoria Street. The shop has been in continuous operation for the past 150 years and was started by Mr. Al Trapiche’s great-grandfather. Mr. Al Trapiche, who by profession is an engineer, maintains the shop as part of his contribution to Egypt’s cultural heritage. A stance which he feels is important and one in which he takes great pride, although he admits sadly his sons are not interested in the tarboush business. Mr. Al Trapiche took over the business when his father died in 1977 and now works there only three days a week, although the shop is open every day. His is a labor of love. He confessed that he now sells only two or three new hats a month for 30 Egyptian pounds or $10 each and also performs repairs for customers. A large part of his business is making costumes and headgear for movies, operas and plays. On the subject of the tarboush one could not ﬁnd a better tutor. The shop is a living museum for anyone wishing to study the subject. Everything in the shop is original and most of its contents dates back to its founding including 70-year-old boxes in which imported Czechoslovakian red felt was originally packed. To maintain the ambiance of the original establishment Mr. Al Trapiche proudly boasts that the shop interior has only been painted once since its founding. 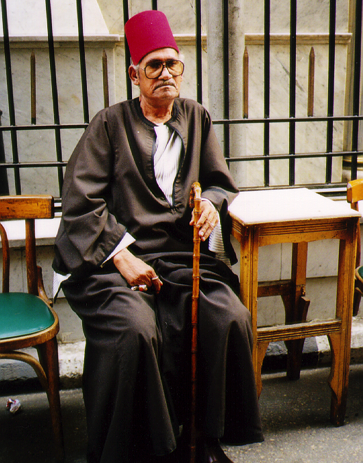 Mr. Ahmed Mohamed A. Al Trapiche the 40-year-old proprietor of Cairo’s oldest tarboush maker’s shop. Close up of the Waga showing finished hats and views of the shop.